0 Comment May 12, 2018 Like? This week PTZOptics had Andrew Haley from Wirecast on the live show to talk about Wirecast 9 and the new PTZ camera controls. Wirecast announced a bunch of new features at the 2018 NAB Show with Wirecast 9 that includes an advanced partnership with PTZOptics. Andrew Haley is the chief product evangelist for Wirecast a company owned by Telestream which is celebrating its 20th year in business. What’s new in Wirecast 9? Andrew tells us that Wirecast is now going to be rolling out a new feature release schedule to keep up with the fast-paced live streaming industry. Wirecast 9 included PTZ camera controls, xKeys USB controller support and camera presets that can control PTZOptics cameras integrated into each camera shot. The new Wirecast Gear comes in HDMI and HD-SDI versions which include pan, tilt and zoom controls for the PTZOptics cameras over IP (an Ethernet connection and static IP address). All of the features in the software can be tested in the trial version allowing users to test with their cameras, capture cards and network streams inside Wirecast before purchasing. Wirecast has a great new pan, tilt and zoom integration and “PTZ Controller” which is found in the “Window” tab inside Wirecast. Once you open the PTZ controller the window will just need your cameras static IP address. Wirecast is setup by default to connect to PTZOptics cameras with the Port: 5678 and VISCA Address of what to make things easy. Wirecast includes three different control options for Pan, Tilt, and Zoom operations which area D-Pad, Analog Pad and a Map. Wirecast also includes Zoom and Focus controls under the PTZ buttons in the interface. The Focus options inside Wirecast allow the user to toggle between manual focus and autofocus for fine-tuning. If the yellow box is on that means the focus is locked. If you un-check the yellow box the camera focus will unlock and go back into autofocus. Wirecast has implemented detailed camera control options inside their Version 9 release including Exposure and White Balance detailed controls. Wirecast supports five different camera exposure settings including Auto, Manual, Shutter Priority, Iris Priority and Brightness modes. These camera exposure modes will affect whether the operator will have control of various settings including Shutter Speed and Iris. For example, in auto exposure mode the operator will not have control of Shutter Speed and Iris. In manual camera exposure mode, the Wirecast operator will have full control of the camera’s range of shutter speed and iris settings. White balance modes are very similar to camera exposure modes as they will allow additional controls for Red and Blue gain. When you are in the auto white balance camera mode inside Wirecast you will not have controls over the Red and Blue Gain settings. But when you are in the manual white balance mode, users will have full control over the Red and Blue Gain settings. Wirecast has built-in slider options for each color gain and this makes it very easy to quickly color match multiple cameras. Wirecast also have five different camera white balance modes that integrate with the PTZOptics cameras which include: Auto, Indoor, Outdoor, One Shot and Manual. In conclusion, Wirecast has integrated one of the most advanced PTZ cameras controls for live streaming software on the market. Allowing Wirecast operators the ability to control multiple PTZ cameras opens all new doors for video producers. Now smaller video production teams can use more cameras and operate them in a live event or streaming scenario. 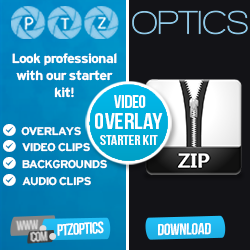 Many of the Wirecast 9 customers will love the PTZOptics camera integration. Learn how to setup the Wirecast Gear with PTZ cameras and NDI video inputs here. Wirecast 9 release at the 2018 NAB Show includes xKeys Support. Learn more here. Camera options for the Wirecast Gear here. How to bring video conferencing callers into Wirecast here. Wirecast Gear Overview with Andrew Haley from Telestream here. How to bring in Skype into Wirecast here. In-depth Wirecast Training course here.